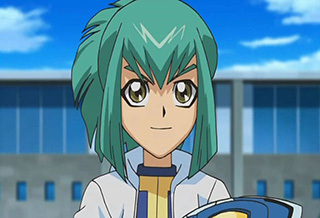 Leo (Rua) – Along with his twin sister Luna, he aids Yusei Fudo, whom he adores and supports in his duels while making fun of fate. Leo is the older twin of the two and has a lively and blundering personality, being easily irritated by his sister’s insults but does deeply care for his sister. Leo also has a funny ability where he can rotate his hand like a wheel when he is excited. Leo lives together with Luna in the Tops resident area. They spend most of their time alone together as their parents are usually at work. They are educated via the Internet, so they spend most of their time inside. In the dub, Leo’s actual name is Leonard, but he prefers to be called “Leo” for short. Luna was able to sense Yusei when he was shocked by the police officers so she and Leo rescue him after his duel with Trudge and take him to their home. Yusei wanted to leave, fearing he may place them in danger, but Leo talks him into a Duel. (In the English dub, Yusei had lost his memory, so he agreed to duel Leo to get his memory back.) After Yusei wins, they manage to get him to stay for the night. Leo and Luna awaken the next morning to find that Yusei had left after modifying their Duel Disks to fit their small arms. Leo then leaves with Tenpei to find and duel the Black Rose. They eventually meet up with Yusei again and shortly afterward the Black Rose appears, but leaves after seeing Yusei’s Dragon’s Birthmark, which seemingly disgusts her. Leo seems to show fear for both the Black Rose and the Birthmark. Luna was selected as someone to participate in the Fortune Cup, but she did not feel like participating, so Leo planned to disguise himself as her and compete instead. The next day, Leo enters the Fortune Cup in disguise as Luna, but quickly loses to Greiger after a hard-fought duel. Using Zigzix’s Signer-detecting technology, Lazar determines that Greiger dueled Leo instead of Luna. During the consolation duel where Luna dueled Professor Frank, Leo was hypnotized along with his sister and later reveals to her that he had unconsciously given himself the task of protecting her while she protects the Duel Monsters Spirit World. He was awakened from his trance when the duel ended. At the end of the first day of the Fortune Cup, it is shown that Yusei would be paired against Greiger the next day. As Tanner wondered what kind of Duel Runner he has, Leo remembered something and ran off. He was surprised that Greiger’s Duel Runner is much bigger than Yusei’s. After the Fortune Cup, Leo and Luna learn what a Signer is. When Yusei goes on his own to Satellite, Leo begins to worry about him. After Yusei’s duel with Kalin, Luna has a vision of the Fifth Dragon, which Leo assumes is his card, Power Tool Dragon, and believes himself as a Signer. Leo, believing that the Signers should work together to fight the Dark Signers, learns of the Arcadia Movement and goes to find Akiza. When he gets there, he is captured, chained, and forced to duel Sayer to get to her, losing in the process. He is eventually rescued by Tanner and Yanagi. Later on, he is told about the situation between the Signers and Dark Signers by Goodwin. Despite not being a Signer himself, he decides to help Luna and the others in their cause. When one of the Dark Signers, Devack, shows that he has the Ancient Fairy Dragon card, Leo, Luna and Trudge head over to where he is. On the way there, Luna is transported to the realm of Duel Monsters Spirits. When Leo goes looking for her, he runs into Devack and is caught in a shadow duel. Whilst Devack is somewhat uninterested due to him not being a Signer, Leo is determined to fight in order to save Luna. However, when Devack summons his Earthbound Immortal, it is Luna who comes back to save him, and together they defeat Devack and reclaim Ancient Fairy Dragon. After the Dark Signers’ defeat, peace returns to the city and Leo attends Duel Academy with Luna and his friends. When a boy named Lucciano enrolls into Duel Academy, Leo is instantly annoyed with him and becomes jealous of him hanging around Luna. Noticing Lucciano giving her a Duel Board, a motorised skateboard that can be used for Turbo Duels, Leo gets Yusei to make him one. When Lucciano, actually a member of Ylliaster, forces Luna into a Turbo Duel, Leo joins in, and they both find themselves against Machine Emperor Sukiel. Despite his best efforts to defend, Leo is beaten by Lucciano and knocked off the bridge. He is saved when the Signer marks summon out the Crimson Dragon. Following the duel, they find that Lucciano had disappeared and wiped the memory of the Duel Academy students. Leo plays a Morphtronic Deck that features an Archetype of monsters known as “Morphtronics” (“Deformers” or “D-Formers” in the Japanese version) whose effects are dictated by Battle Position. The monsters’ appearances are derived from various household objects such as mobile phones, lighters, and magnets. In addition, Leo also has a Synchro Monster called Power Tool Dragon, who can equip a spell card from his deck. Its similarity to a dragon that appeared in a vision Luna had led Leo to believe he was the fifth Signer, but his notion turned out to be false. Power Tool, however, has shown signs of having a conscience, protecting Leo from attacks and understanding with others say. Whether there is a link between Power Tool and the fifth dragon is yet to be shown. 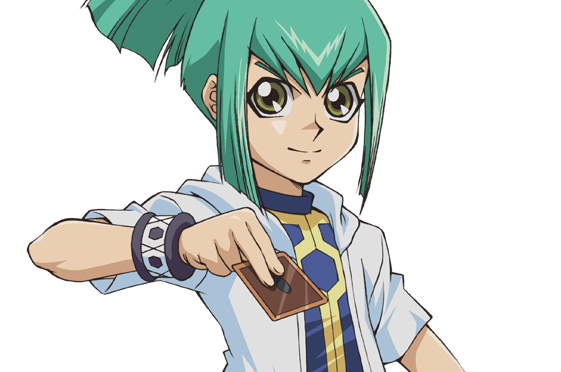 In the third season, he discovers Duel Boards, motorized skateboards that are compatible with Duel Disks, and asks Yusei to make one for him.